The main orthopaedic injuries that we see in dogs are either partial tear or complete rupture of the cranial cruciate ligament (CCL). The CCL is also known as anterior cruciate ligament or ACL which is a name familiar to most people as a common site of injury in humans especially amongst sport men and women. The second ligament in the cross-shape is the posterior cruciate ligament which causes significantly less frequent and less severe problems. How does cruciate damage occur? Usually by sudden excessive twisting force to the knee joint but often in combination with a gradual time-related weakening of the ligament itself - the weaker the ligament the less force required to cause damage. In many instances the "excessive force" is related to a dog being overweight such that the weight of the torso is creating excessive loads on the knees and these ligaments. It is not fully understood why ligament weakening seems to occur significantly in some dogs and not others but it is likely that a dog which ruptures a CCL in one leg has a 40-60% of rupturing the one in the other leg at a later stage. A partial tear of the ligament will often produce enough pain and inflammation to cause sudden marked lameness in the affected hind limb but the intact remnants of the ligament still provide a degree of stability to the joint. A partial tear may effectively rectify itself by laying down scar tissue to the extent that lameness symptoms may gradually largely resolve at least in the short to medium term. In these cases anti-inflammatory drugs for pain, restricted exercise for 6-8 weeks and good weight maintenance are all part of the usual conservative management recommendations. A complete rupture (see diagram below) will also cause sudden onset of marked lameness in the affected hind limb but there will now be accompanying serious instability of the joint. There will also be the possibility of meniscal (cartilage) damage occurring. In this case that ongoing instability is likely to cause development of progressive arthritis . This is especially so in larger dogs.Such arthritis will result in varying degrees of chronic discomfort/pain and lameness in the longer term..
What are the treatment options for CCL rupture? Any recommendation for treatment is typically preceded by general anaesthesia or heavy sedation to take X-rays. This enables the veterinarian to rule out other injury that may be contributing to the lameness and also to get full assessment of the joint instability which may not be apparent in a tense and painful conscious patient. . Essentially the same as described above for partial tear with restricted exercise, pain relief and weight-loss as necessary. In small breeds (say less than 8-10 kg) this may well achieve a good long-term result but the prognosis for a good conservative management outcome drops as the size and weight of the dog increases. Even in a small dog the outcome may not be good if there is very marked instability of the joint at rupture. There have been many and varied techniques used for surgical stabilisation over the years and both opinions and the results of studies of outcomes have been diverse. Our practice essentially recommends one of two procedures which we perceive as good options. a. An extra capsular technique where the joint is opened and examined and then a synthetic band/suture is positioned so as to replicate the stabilising effect of the cranial cruciate ligament (see diagram below). At time of writing the fees for this type of surgery at a general veterinary practice may be around the $2000 or more mark. Results appear to be reasonable in smaller and medium size dogs that are not too active during the recovery period. A good pain relief regimeis essential in the immediate post-operative period. This is very much a specialist surgeon procedure and and overall cost may be in the order of $4000-6,000. 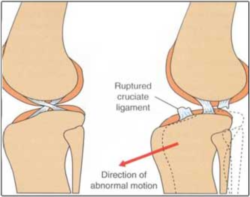 Opinions regarding the need for surgical intervention, and the type of intervention required, vary quite widely when it comes to cruciate ligament injury. There is no doubt that some dogs seem to do quite well long-term with conservative management (ie no surgical intervention) even after a complete ligament rupture. This is especially so in smaller dogs. On the other hand it is clear that there are many dogs that will go on to endure long term arthritis, pain and joint instability without surgical intervention. This is increasingly the case as the size and weight of dog increase. In some cases the affected limb may become virtually useless and in overweight dogs the damaged joint may result in someserious questions arising about restricted mobility and quality of life.